The Resort range is a stunning collection of coplementary bathroom fittings created to bring a modern, contemporary and luxurios look to any bathroom space. By incorporating the latest in RIMLESS Design Technology and WRAS approved GEBERIT Flush Mechanisms, Resort delivers on performance and design. The collection of RIMLESS WC options cater for wall hung, back to wall, space saving as well as comfort height solutions. The beautiful basin design is suitabe for wall, pedestal and furniture mounting and is cmplmented with specially designed brassware options. Prices start from €680.00 excluding mono basin mixer. 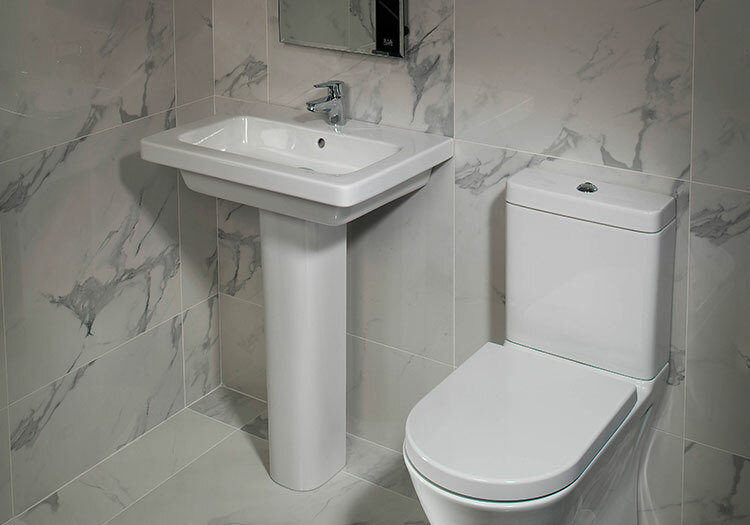 Price includes standard height basin W500x H830 x D460 1 tap hole and pedestal and a close coupled rimless compact WC.